The ‘Pink Tax': Does Shopping Like A Girl Cost You Money? It’s not just razors, though. Toys, like scooters that are marketed to children, can vary wildly in price depending upon their paint job. One retailer listed blue children's scooters for $24.99 and an identical pink scooter for $49.99. 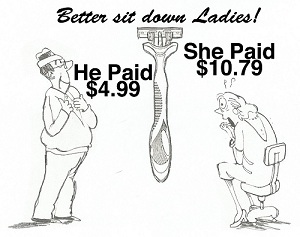 Incontinence aids marketed to men contained twice as many pieces as the same product marketed to women. Either in quantity or in cost, pink packaging costs quite a bit!